Create a copy of an entire course. Including it's stories, chapters and pages etc. In this tutorial you will learn how to duplicate/copy a course. 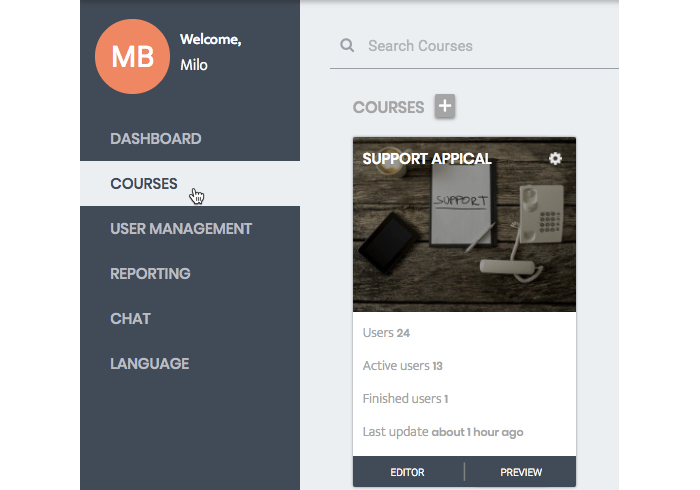 It’s possible to duplicate or copy a course in AppicalNow. This can be very useful if you want to create another course that is very similar to an existing one. You can edit the duplicated course to your preferences instead of creating one from scratch. *We recommend to use Google Chrome to ensure an optimal experience when using AppicalNow. Step 2. Click on the gear-icon in the top right corner of the course that you want to style and select ‘Duplicate’. Step 3. Enter the name of your course in the text field that says 'Course name' and click on 'Duplicate'. Step 4. The course will now start duplicating. This might take a while, depending on the size of your course. Step 5. Refresh the page to see if your course is duplicated. If it's done, your course will not be faded anymore and the text with 'Processing' (see image above) will be gone. Hooray! You now know how to duplicate a course!